The British Aerospace 146/RJ family is a four-engine regional airliner also known as a feederliner formerly manufactured in the United Kingdom by British Aerospace. Production ran from 1983 until 2002. 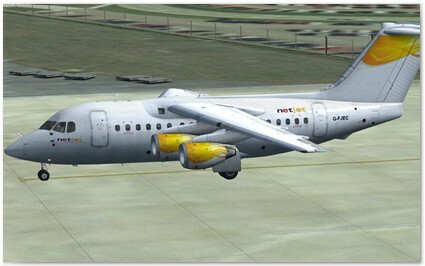 Manufacture of the improved version known as the Avro RJ began in 1992. 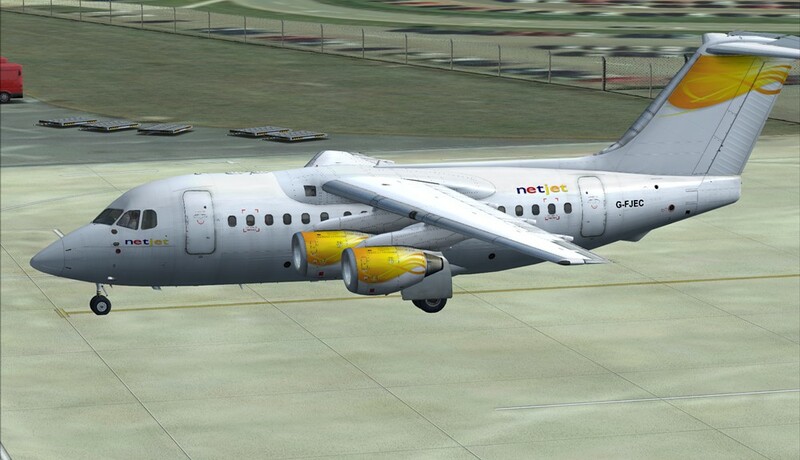 The Avro RJ/BAe 146 family was the most successful of British civil jet aircraft manufacture and the last British built civil airliner, when production ceased in 2002. Although saying that, the wings were made by the Textron Company in the USA and the tail was built by Saab/Scania in Sweden. The aircraft has a very distinctive yet attractive style by being of a topwing and T-tail design. The aircraft is also liked by the airline industry for its STOL (Short Take-Off & Landing) performance and very quiet noise level. It is commonly called the Whispering jet. To this day it is still used on scheduled flights around the world, especially at the City of London Airport. It is mostly used for the short low density routes and was optimised for the typical 300 nautical mile range although most routes are longer. 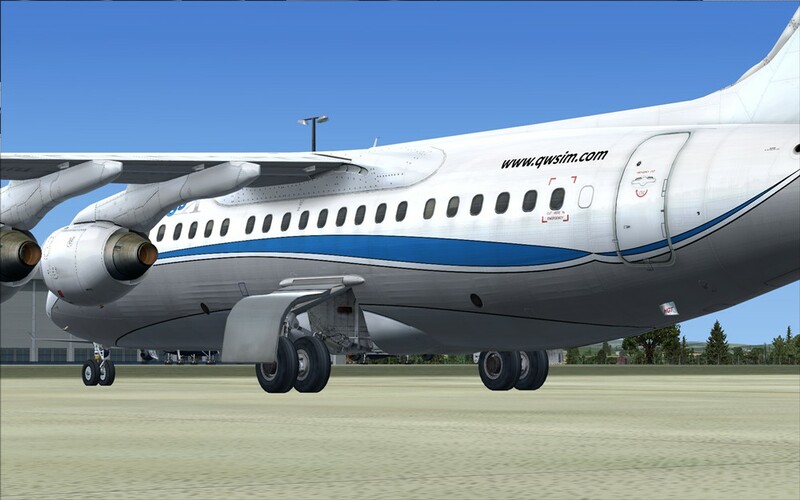 In development for more than three years, the Quality Wings add-on product for FSX is now released and represents the BAe146 and Avro RJ family series. This review will concentrate on the FSX RJ series release. 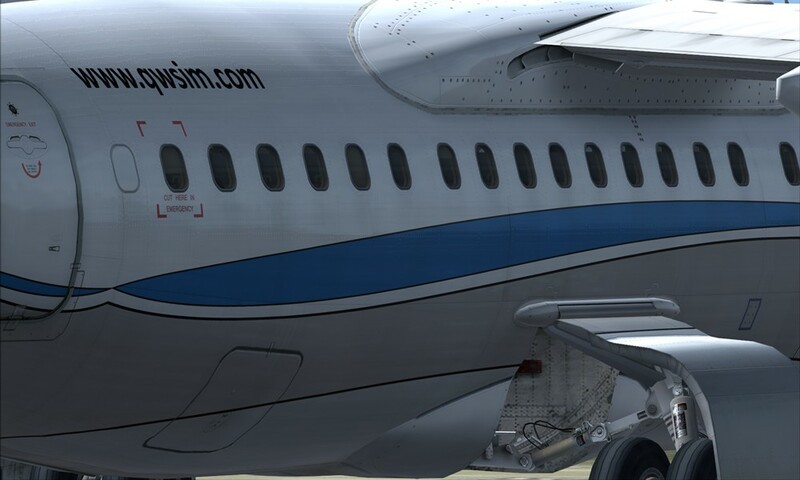 It was a conscious decision by the Quality Wings designers to enable inexperienced members of the flight sim community to fly this aircraft without having to worry too much about all the more advanced systems. Also, to please the more seasoned simmers, the partly functional systems still function so much that their operation can affect flight performance of the aircraft. The Flight1 downloader uses the Flight1 e-commerce wrapper for purchase and download. As with almost all sellers now, Flight1 uses anti-piracy software where you have to verify your purchase online before installation. 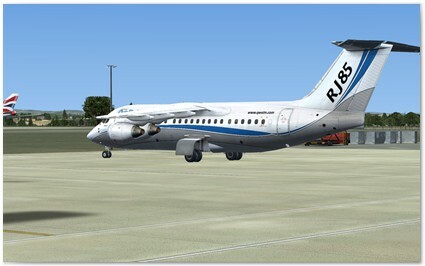 On first use you have the choice of the 3 variants of the RJ; RJ70, RJ85, RJ100. 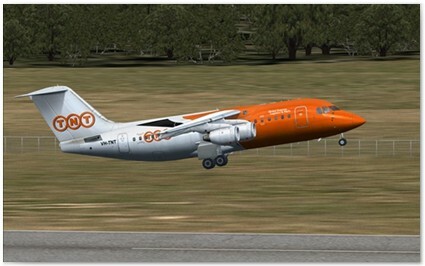 Each is in the Quality Wings house colours and you get 1 private livery in the package. If you want extra liveries there are many alternative's free on the Quality Wings website www.qwsim.com download section (FSX versions are to the bottom). Installing a new livery is simple via the Dispatcher Installer. 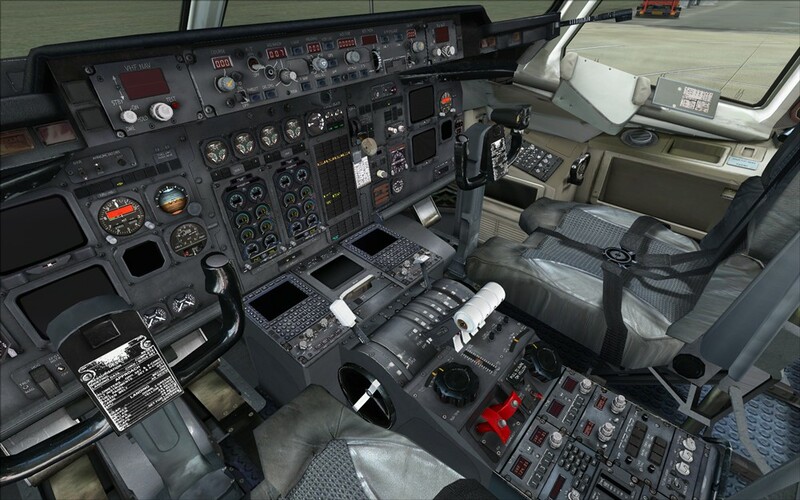 On opening in FSX you are greeted in the pilot's position with an array of the instrumentation of the Flightdeck. The sim opens in a semi start position, with electics on. The first thing to strike you after you cancel the red and yellow warning buttons to curb the alarms, is a very highly detailed rendering of all the instruments and switches. 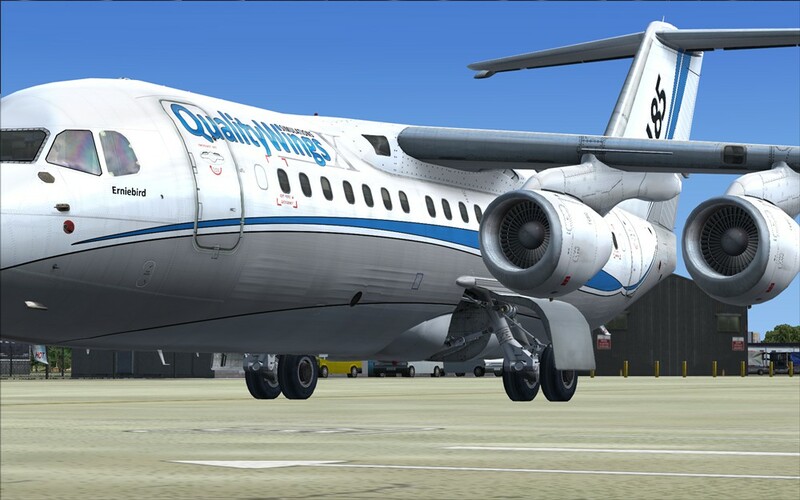 Quality Wings creators have done an impressive job and brings this model into the 21st century style of FSX add-ons, and is up there equalling if not bettering the other top makers in the range of FSX community products. 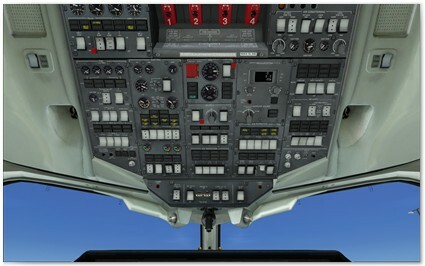 A switch to the outside view brings again the visually appealing HD look that is now becoming the new standard for flight sim products. The quality of the texture rendering is very crisp and the Quality Wings house colour is very slick and appealing. The detailing in both the internal and external model is to use the makers own branding; "Quality" and must be commended to the team who have brought us an aircraft that has been missing from our hangars for too long. 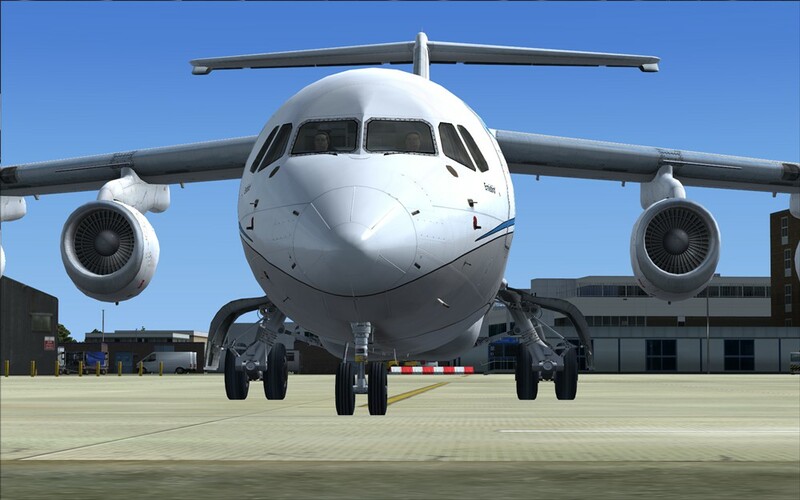 Flying this aircraft straight out of the box is achievable, but remember that the reason for obtaining this aircraft is to better your standard and realism of flying in FSX. The most important part of any aircraft add-on is to read the flight manual and Quality Wings have put together an excellent flight manual. There are 2 parts to the manual, a quick-fly get me up there fast set of instructions and a very detailed in depth set of instructions. Both sets of instructions are very informative with good graphics and clear and easy to understand information. 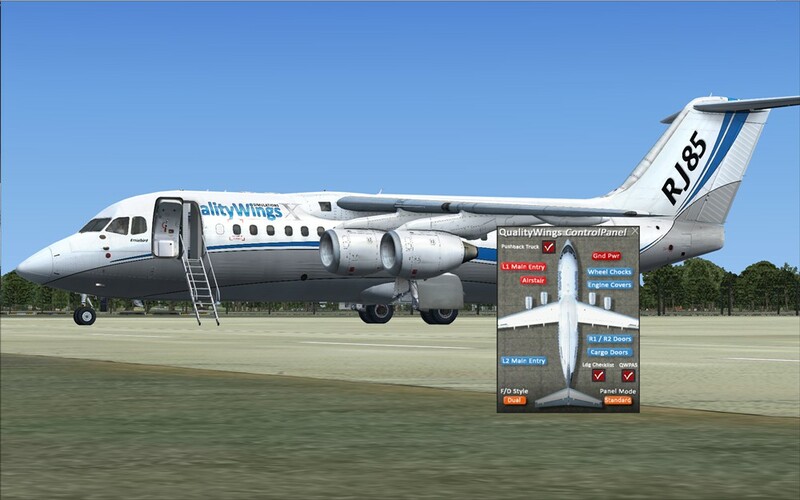 This aircraft is from the latter part of the 20th century in aircraft design aerodynamics and instrumentation, although top notch in its day, learning how to use it is important in the correct way to fly the aircraft in FSX. So reading the manual is a requirement to understanding all the instruments and controls. I was a newcomer to the larger aircraft in FS have been finding the manual to be my bible when flying the aircraft. This has helped me in a few days to be able to take off and land the aircraft with some resemblance of ability thanks to the excellent set of flying instructions included in the manual. For this review I have only flown the aircraft manually, I have not used the FMC to set up a flight controlled by the FMC as I think that is more of an in-depth learning curve and would not be fair of me to pass comment. But judging from the manual the learning will be fun and informative when I move on to it. As I said in the beginning, you can fly straight out of the box, but if you follow the manual quick launch section you can be flying in no time. I followed the instructions and got to where we start the engines, following on with the instructions, switching on the necessary outside Nav lights and beacon before starting. Something I learnt here was (coming from being a GA pilot) that each engine has to be started separately. I took the outside view and was surprised to not only see the fans turn but the sound was music to the ear's. As each turbine fired up you see first, the dark plume of exhaust fumes followed by a distinct wisp of secondary fumes. You also notice the flexing of the wings as the vibration is absorbed by the wing. Engage the flaps and you hear the distinguishing sound of the flaps extending from the wing and at perfect speed. The throttle only needed to be moved slightly for taxi, although the aircraft will move at idle power. 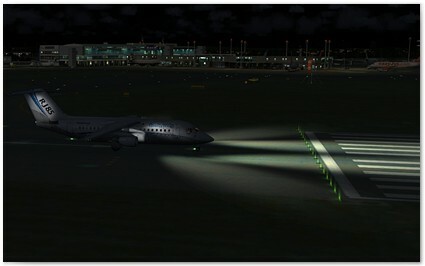 Switch on your taxi lights and proceed to the runway and when ready, switch on your landing and strobe lights. Quality Wings have produced a superb rendering of the light cluster housings and kept the light inside the lens enclosure including the strobe and beacons. This type of lighting brings a new standard to today's flight simming and produces a visual effect of realism that other developers will have to follow. So it was throttle up and head down the runway, at the rotate, the aircraft will just take to the air and just a gentle pull on the yoke is required into the climb. If flying manually without the FMC then before takeoff ensure that you trim the aircraft correctly or you will encounter a stall. Viewing the takeoff from an outside viewpoint is very impressive. The visuals of the aircraft rolling down the runway with the flaps extended is like looking at a real aircraft. Watching the landing gear retract into its housing wants you to replay it again and again. If just after takeoff and gear up, switch to tower view and you would think you were looking at something real. A new standard achieved by Quality Wings are the night time textures of the light systems both inside and outside. 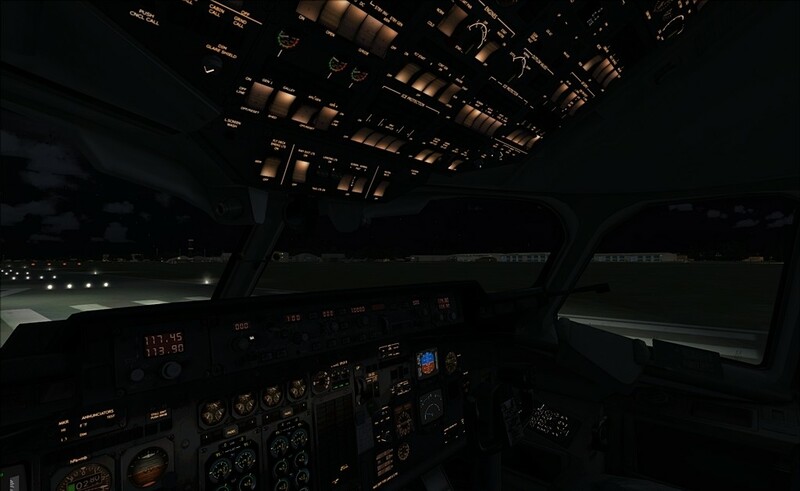 The dark cockpit lighting is very realistic (see photo), but the outside lighting is something that can only be described as remarkable. 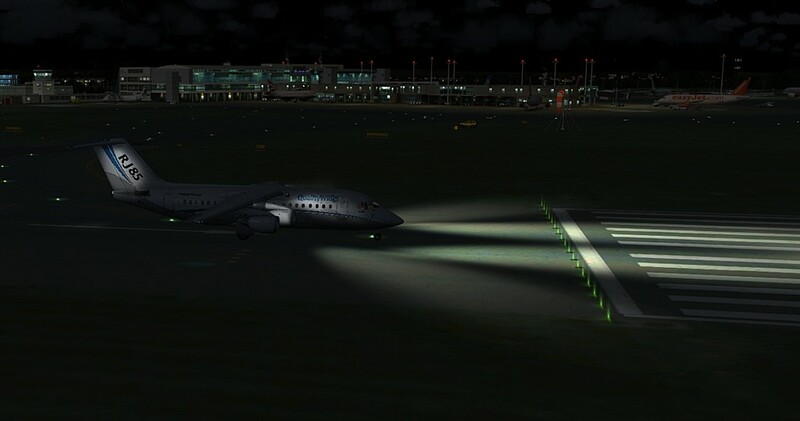 The navigation and strobe lights produce the ground flash that is so clear and precise together with the full landing lights on that you cannot help thinking it is more of fact than fiction. I keep finding with this aircraft that the standard has been set so high that a major change will now have to take place in add-on production for FSX/P3D in the future. Even a manual approach and landing is something that has to be learned, so make sure that you read the manual. Two things are very important here; speed and angle. Reduction of speed early into the approach is essential if you do not want to nose dip into the runway concrete and angle of approach is just as important. Use the PAPI if it is there or other outside visuals, too steep and again into the concrete you will go. 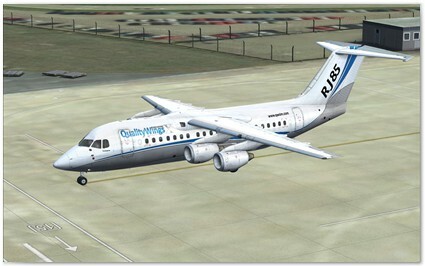 The RJ in design was equipped with a very impressive air braking system which is fully modelled in the aircraft. By using it you will be achieving some very impressive landings. 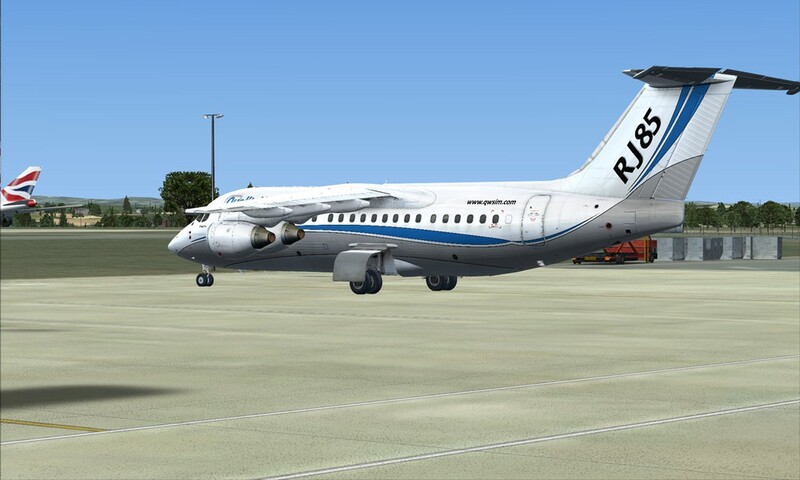 Quality Wings have produced a magnificent model of the AVRO RJ for FSX, that will see many FSXer's step up to the heavier aircraft section of the sim. The textures are spot on with no instances of bleed or blur and the detail is just amazing. Some models were built with an onboard passenger stairway for use at regional airports with no apron facilities, this again is modelled and is very pleasing to the eye to see it in operation. (But only on models that an airline stipulated), also you have to use the QW control box available in drop down views or press the pedal adjust control in the VC. There aren't any interior passenger cabin views, which is unusal and slightly disappointing for an addon of this quality, but all exterior doors function including the cargo doors were animated. The detail is so good even the tyre manufacturers name is there. 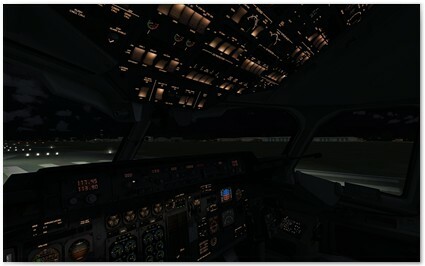 The lighting system is superb and a night-time outside take off is more like fact than fiction. I have been unable to find anything to dislike about this addition from the Quality Wings Hangar. The design team have raised the quality and standard to even higher levels of realism and functions that could never have been dreamed of a few years back. I can only commend their achievement in taking this FS add-on to gold position in the quality stakes. Also available is a download paint kit and is designed for the inexperience painter to be able to paint his aircraft. • These are only recommendations. More powerful PCs may be necessary to cater to your Simulation expectations. before registering you will get a polite request to register. 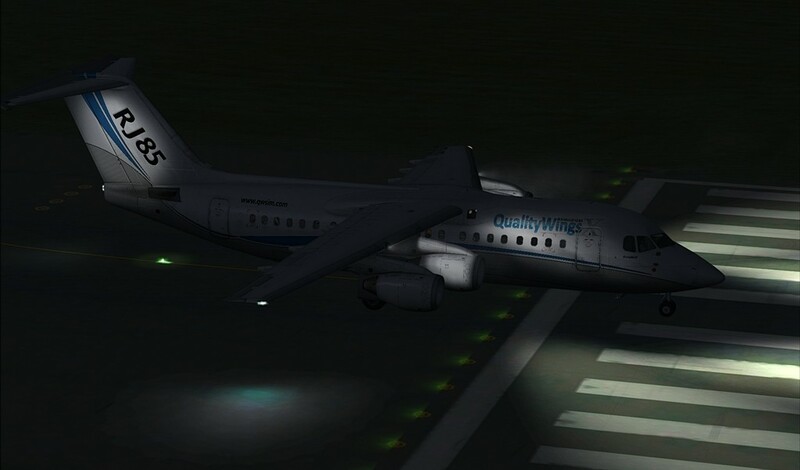 I can only heap praise on the Quality Wings design team that has brought us this FSX version of the BAea 46/RJ family. They have produced a magnificent model, there has been nothing that I have disliked about this product except the lack of a modeled cabin.